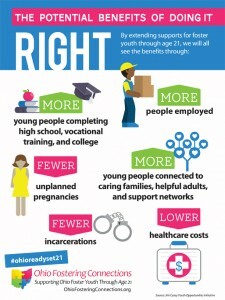 A concise introduction to how states can and should extend supports to foster youth through age 21. The brief supports advocates in making the case for greater or more targeted investments and to help those interested in developing similar analyses at state and local levels. The brief looks at three important areas: education, family formation and criminal justice. Examines youth experiences of homelessness upon exiting foster care. This is a longitudinal study that follows a sample of young people from Iowa, Wisconsin, and Illinois as they transition out of foster care into adulthood. The study compares the outcomes of young people from one state (Illinois) that allows foster youth to remain in care until 21 to outcomes of young people from two other states (Iowa and Wisconsin) in which foster youth generally age out when they are 18 years old. Copyright © 2019 | www.ohiofosteringconnections.org. All rights reserved.